A 4 out of 7 last week, but come on who saw Salford beating St Helens!? But on to this week, a tough clash between Leeds and Bradford is probably the pick of the games, and my picks look like this. The quiz is fortnightly now, I'll try and keep that rate up! 3. Which NRL stadium is this? 4. Which county has the largest representation in the Super League? 5. How many players can a Championship or Championship 1 club have on loan or dual registered? 6. Which NRL club is nicknamed "The Mountain Men"? 7 points up for grabs ladies and gents, answers after the click and scroll. Well I hope you all enjoyed the magic weekend, this weeks quiz (the first for a few weeks I know) is all about it so brush off your hangovers and give it a good bank holiday go. Post your scores in the comments! 1. Where was the first Magic weekend held? 2. Who was the only player to get a hat trick of tries this weekend? 4. 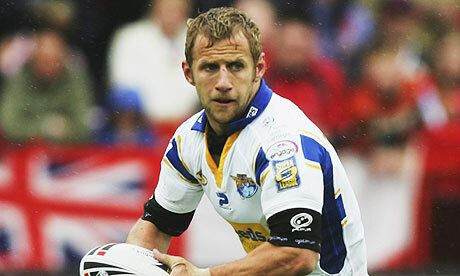 Warrington collected a record points haul at the weekend over Salford – how many points? 5. In the first magic weekend the fixtures were loosely based on derby games. Who did Huddersfield play? 6. Which fixture has been played the most times on a magic weekend? Here's your Ellery Hanley wannabe for this week, nice and easy I think. It's Monday, it's quiz time. This week with Gareth Thomas making the switch from Union we're going to have some league/union based questions to test you. 1. Which cross code player's CV is this? 2. Who's this lovely a chap? A from Welsh Rugby Union international and Wigan player. 3. Name the two teams in this 1996 cross code game. 4. What year did Rugby Union turn professional? 5. What year did London Broncos move to share a ground and name with Harlequins Rugby Union? 6. Plenty of players have stepped across the League/Union divide but what other footballing code have top level rugby league players converted to? Right chaps and chapettes 7 points up for grabs, scores in the comments! As the reason for this going up late (but still on Monday) is due to the Storm beating Leeds in the World Club Challenge game I thought why not do a quiz themed on the new World club champions. 3. How many premierships have the Storm won? 4. What year were the Melbourne Storm founded? 5. What are the two the most popular sports in the city of Melbourne?